The tenth annual National Apprenticeship Week highlights the success of apprenticeships over the last decade, celebrating the positive impact on individuals, businesses and the economy, with the theme "ladder of opportunity." 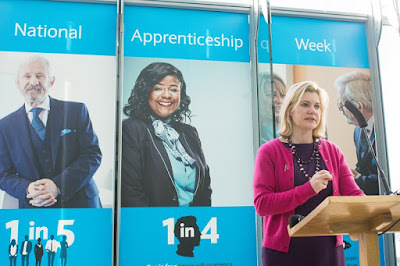 Justine Greening MP, Secretary of State for Education, highlighted at the launch event, not only the lifetime benefits associated with gaining an apprenticeship, but also how apprenticeships are a gold-standard route into a great career. A reshuffle under Prime Minister, Theresa May, saw the government department for skills moved over from business to education so that Greening's department now covers everything from early years, schools and further and higher education, to adult skills and apprenticeships. The Rotherham-born minister attended Oakwood Comprehensive School and Thomas Rotherham College. Apprentices from the University of Sheffield's Advanced Manufacturing Research Centre (AMRC) Training Centre in Rotherham are showing their support for this year's National Apprenticeship Week. The £20.5m centre on the Advanced Manufacturing Park (AMP) focuses on students aged from 16 upwards, taken on paid apprenticeships. Apprentices have opportunities to progress on to postgraduate courses, doctorates and MBA levels. Sponsoring companies range from global leaders such as Rolls-Royce and Tata Steel to local high-tech supply-chain companies. 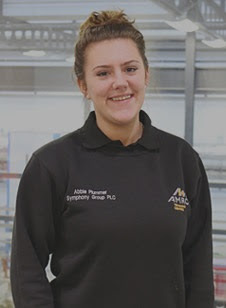 Abbie Plummer is 18 and is an electrical and mechanical maintenance apprentice with Symphony Group PLC in Rotherham. After achieving top marks in her GCSEs Abbie initially stayed on at sixth form to study A Levels but found she wasn't enjoying being in the classroom. "It wasn't my way of learning. I like practical learning," said Abbie from Brinsworth. "I have always had an interest in engineering and making things. When I was younger my grandad, who was a steel engineer, had a shed full of tools and machinery. I used to spend hours playing and building things in there. "When I first visited AMRC I was blown away by the facilities on offer – the training is the best in its field, and has a top level of teaching, too. "Through my apprenticeship, I'm developing hands-on skills and gaining industry experience. "I love what I do now. I would not want to do anything else. My grandad is really proud of me as well. "It's an amazing opportunity – learning and gaining skills whilst getting paid to study, and I won't have any debt. "Ideally I'd like to continue my apprenticeship right through to university studies." The centre is hosting an open event on March 9 between 4:30 and 6:30pm sepcifically for those considering next steps from sixth form education or college.